Lucasfilm and Disney XD have just released a new Star Wars Rebels clip from the next episode, titled “Visions and Voices.” Catch it Saturday, December 10 at 8:30 p.m. ET/PT. Watch the “Visions and Voices” clip in the player below and check out new images from the episode in the gallery viewer at the bottom of this page. 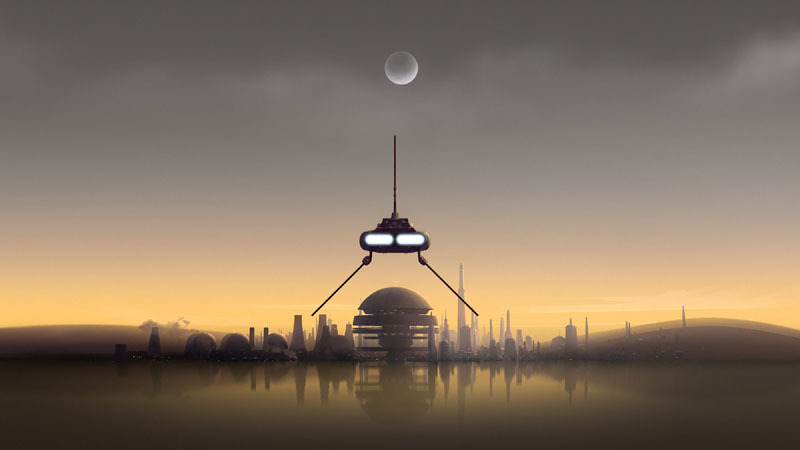 Having established a secret base on Atollon, the Ghost crew, now led by a more powerful Ezra, have been strengthening the rebel fleet by acquiring new resources and recruits eager to stand against the Empire. However, the Imperial efforts to eliminate the rebellion are now being led by the coldly analytical Grand Admiral Thrawn, whose strategic, tactical and cultural insights make him a threat unlike any they have faced before. In season three, Ezra and Sabine take on new roles and challenges as the rebels prepare for their biggest mission yet – a direct assault on the Empire. “An Inside Man” begins when Ezra and Kanan, seeking information on a new Imperial weapon, infiltrate the Imperial factory on Lothal where they must trust an unlikely ally to escape a lockdown of the building. Star Wars Rebels is created by Dave Filoni (Star Wars: The Clone Wars), Simon Kinberg (X-Men: Days of Future Past), and Carrie Beck. The Lucasfilm Animation production is executive produced by Filoni and Kinberg, and co-executive produced by Henry Gilroy. 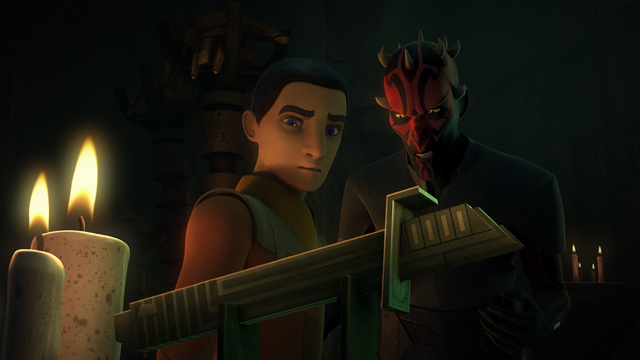 The returning voice cast for Rebels season three includes Freddie Prinze Jr. as Kanan, Vanessa Marshall as Hera, Steve Blum as Zeb, Tiya Sircar as Sabine, Taylor Gray as Ezra, Dee Bradley Baker as Captain Rex, Captain Gregor and Commander Wolffe, Sam Witwer as Darth Maul and David Oyelowo as Agent Kallus. New to this season are Tom Baker (Doctor Who) as the intriguing Force-wise Bendu and Lars Mikkelsen (House of Cards) as the voice of Grand Admiral Thrawn. How have you been enjoying Star Wars Rebels this season? Are you going to watch “Visions and Voices”? Let us know in the comments below!